All week we were excited to visit Sansei Maui, and even with all the anticipation, we were not disappointed. 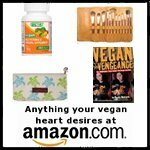 We went with two of our omnivore friends, and they were blown away by the fish selection, but we focused on the abundance of vegan vegetable options. Normally I love sushi restaurants because I've never been to one that doesn't offer at least one vegetable sushi roll, even if it's just cucumber or just avocado. And sometimes, that's really all I need. But, I'm human after all, and a menu as loaded with vegetable sushi as Sansei's makes me really pumped. We were greeted by a really outgoing, friendly waiter, which can often make or break a really good meal. He walked our omni friends through all the pretty fish they could eat, and then told us about the local, seasonal vegetables used in their vegan rolls. The server explained that Sansei Maui takes a liberal approach to labeling things as appetizers or entrees, and instead they allow customers to just pick what they want and it comes out when it's ready. I loved their concept of "ordering as you go, eating until you're full," because we have a tendency to over order with sushi. 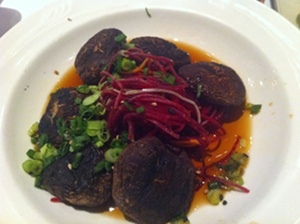 We started with a grilled portobello "appetizer" that was nicely cooked and immersed in a tart broth and covered with strips of beets, pea shoots, and scallions. 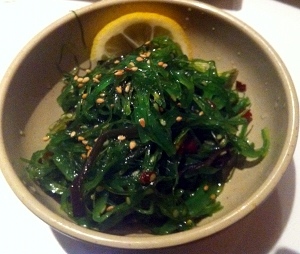 One of our early dishes was the ocean salad, which is a standard seaweed salad. My husband and I can pound some seaweed salad, and this was a tasty one. We stayed away from the standard rolls that we can get at all sushi places, like the cucumber, the avocado, and the asparagus roll, although I'm sure each was good. The waiter veered us away from natto maki, although I was interested in trying it, and we also didn't order the pickled radish or ume shiso maki. If we go back, I'd like to try all the vegetable rolls. 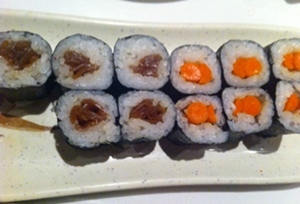 We did have the gobo maki, which is pickled burdock root, and the kampyo maki, which is Japanese sweet squash. We eat burdock at home often, but it's always a beige color, not the bright orange of this burdock. I suppose the pickling process changes the color. 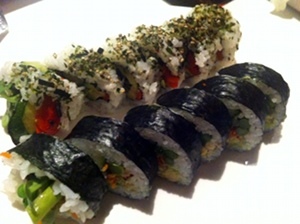 Either way, it was crunchy and flavorful and we loved the roll. The sweet squash reminded me of caramelized onions, and was even cut in thin strips like onions. 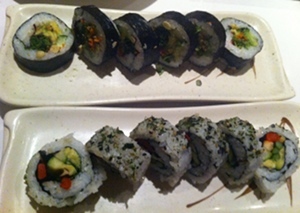 Our two favorite rolls were the paia maki and the grilled veggie roll. The paia maki is made with kula greens, avocado, sprouts, cucumber, and pine nuts. The grilled veggie roll with grilled shiitake mushrooms, squash, roasted red peppers, avocado, cucumber, and kaiware sprouts. Our server told us the reason they're so good is because they're all local vegetables and are incredibly fresh. Their rice was perfectly cooked and had amazing flavor. All in all, we loved Sansei's sushi. Another nice perk was that Sansei was amazingly cheap. Maui is renowned for being expensive, and every other nice restaurant we visited lived up to its reputation. Our most expensive rolls were $6.95. Sansei also turns into a karaoke bar at night and they have sushi and drink specials to go along with the singing. We briefly considered ordering more Kirin and waiting it out until the later hour rolled around so we could eat more sushi, but opted not to be lushes and left at a reasonable time. In great news, if you have the skills, patience, and superior quality ingredients, you could make your own Sansei Maui sushi at home with their restaurant cookbook. 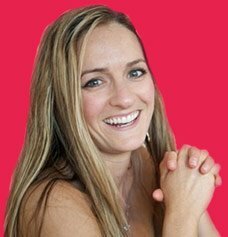 Of course, beware that most of these recipes are going to call for fish, so it would be more of a method book than necessarily for recipes.